Once you’ve arrived somewhere its always a good idea to see how you got there. 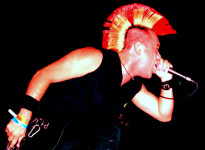 I remember reading an article somewhere where Lars Frederiksen from Rancid says that nobody was born with a mohawk. This is a pretty succinct way of calling out those people who seem to think they have some kind of cooler than thou status on being Punk and have never listened to any other kind of music. None of us has any native claims to this music we love we are all immigrants to it. We all had to start somewhere until that one defining moment when we realize that everything else that we had heard blaring from our stereo or headphones was completely irrelevant. For me it was always good old rock and roll- Chuck Berry, Elvis, the Beach Boys-that’s right that Beach Boys but that’s a discussion for another time. But being a kid in the 80’s I was also exposed/subjected to new wave and mainstream pop-and if you remember 80’s pop then you know subjected is the right word. In elementary school I loved Billy Joel and Huey Lewis and The News. To this day I still love “Uptown Girl” and “The Longest Time.” However I also realized early on that I was different from most my friends back then and that the music and fashion that they were into did nothing for me. Hell, I was the one kid in my class who didn’t like Michael Jackson’s Thriller. This wasn’t me being pretentious- in elementary and middle school its called being weird. However the moment everything changed was when i was thirteen and my older brother Dave lent me his tape of Social Distortion’s “Mommy’s little monster”. Nothing I had ever heard up until then could even compare to the blast of unfiltered raw energy that exploded out of my walkman that afternoon. At thirteen my life was changed forever, I knew that this was the music for me and I realized that it was okay to be an outsider and have your own opinion. I realized there were other people out there who didn’t care about what the popular kids were wearing. Even if I didn’t know what the hell methadrine was back then, I did know that this music spoke to me and that I didn’t want to be “a doctor or a lawyer and get fat and rich”. At that instant I knew that this sound was going to be the blueprint for the rest of my life. A friend of mine in college once asked me what specifically it was about punk that I liked over other types of music and I couldn’t answer him because sometimes you cant explain a thirteen year olds feelings. Now the whole point of this is not to establish my cred but instead I just hope that people realize why they got into the music in the first place and what it means them. I hope people remember how they got to where they are at today. I hope people remember who they were before the mohawk. So give someday a copy of your favorite album and don’t forget to thank your big brother. Thanks Dave. Here endeth the lesson.